This is great for tired feet. I use ths after soaking my feet whenn they feel sore and tired. It really moisturizes and makes your feet soft. This is a companion product to Hand Relief which is also very good. Both smell really good, and a little bit goes a long way. I do LOVE this foot cream. It is rich and luxurious, and smells like a peppermint stick. Yummy! I love Aveda products but some of them are a little out of my price range, and I probably wouldn't spend much for a foot cream, but it is a delicious lotion and I do recommend it. 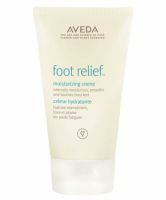 I love this foot cream, it makes my feet so soft and looking great.